Closely related to pheasants, peafowl are known for their highly ornate plumage, particularly the stunning tails displayed by the males. Peafowl are divided into three main groups: Indian peafowl, green peafowl and Congo peafowl. In the United States the rich blue and green Indian peafowl are the most familiar, since this type is the easiest to keep and so is common in zoos, large parks, family farms and homesteads. It’s not unusual to hear all of these long-tailed birds described as peacocks, but that’s not the correct use of the word. Only the males of the species are peacocks. The females are properly called peahens, while young birds less than a year old are known as peachicks. Collectively they are known as peafowl, regardless of age or gender. 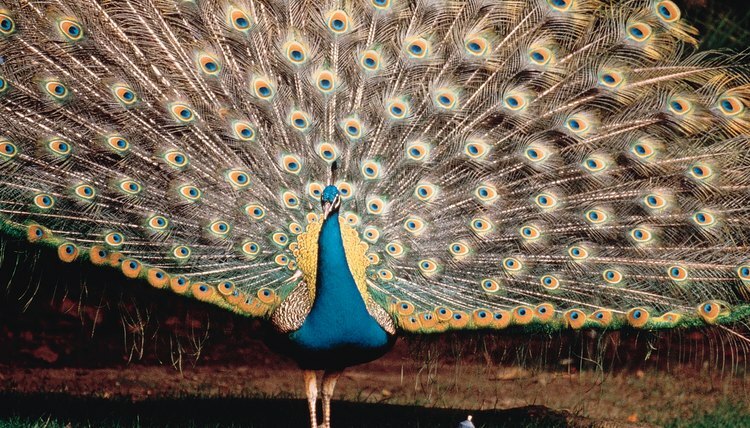 The peacock’s big, bold tail is not actually his tail but is a collection of special feathers called a train that sit above his tail. The train is made up of many long, brightly colored feathers, each of which is covered with large, ornate eye spots known as ocelli that display when the peacock raises his plumage to show off. Peahens typically choose males with the longest tails and the most ocelli. Since it takes a male many years to grow this plumage, only the quickest and the smartest birds live long enough to end up breeding and passing on their good qualities. Indian peacocks have iridescent blue feathers on their heads and necks, with train feathers of bright blue and green. The peahens are much plainer and are mostly a dull brownish-grey, the better to blend in with their surroundings while they hatch their eggs and raise their babies. Green peacocks and peahens both have green feathers covering their heads and necks, but the females’ colors are muted compared with the males'. Congo peacocks are blue and green but lack the long feathers of their better-known cousins. The peahens in this family have muted green and blue feathers covering their bodies. Peafowl live together in groups that forage during the day for seeds, lizards, flowers, insects and small mammals such as mice. At night they fly up into trees for safety, roosting there until daylight returns. During breeding season the groups typically consist of one adult male and his harem of three or four peahens. Immature males live together in bachelor groups. The rest of the year the groups are composed of either all peacocks or all peahens.